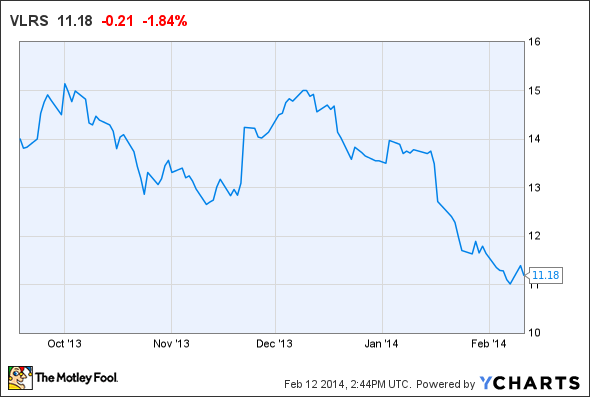 Volaris stock has taken a beating since its IPO a few months ago, but for no good reason. Mexican ultra-low-cost airline Volaris (NYSE:VLRS) made its debut on the New York Stock Exchange back in September, with the stock closing at $14.01 after its first day of trading. Since then, Volaris shares have tumbled about 20%. This just creates an even better buying opportunity for long-term investors. Volaris is one of several airlines making air travel more of a mainstream experience in Mexico. Volaris' ultra-low-cost structure, and its steady growth, could make this stock a multi-bagger in the next five to 10 years. Volaris' business model is very similar to that of Spirit Airlines (NYSE:SAVE) in the U.S. Both carriers have an "unbundled fare" approach to pricing: Base fares tend to be low, but then passengers have the option to pay extra for additional services that may be complimentary on full-service airlines. Both carriers are also similar in that they have very low cost structures. Through the first nine months of 2013, Spirit Airlines reported adjusted CASM -- a measure of unit costs -- of $0.10. Volaris had an even better cost structure, with unit costs of approximately $0.094. That's more than 30% below the average unit cost of other airlines in Latin America. For Spirit, low costs have allowed it to underprice other U.S. airlines, thereby encouraging its customers to travel more often than they would otherwise. Volaris' opportunity is even bigger. Mexico still has a huge market for inter-city bus service. Volaris, and a few other ultra-low-cost carriers, are finally bringing the cost of air travel within reach for many members of the emerging Mexican middle class. Volaris is well-positioned to be one of the leaders as Mexico's air travel market grows. Last week, the company announced that it is opening an operational base in Monterrey, which is the wealthiest major city in Mexico. As of this spring, Volaris will offer flights to 11 other cities in Mexico from Monterrey. Volaris has also made plans to expand its fleet with aircraft that will be cheaper to operate than the Airbus A319s and A320s it uses today. Earlier this week, Volaris announced that it had agreed to lease 16 new A320neo and A321neo aircraft, which will be delivered between 2016 and 2018. Including this order, the Volaris fleet is expected to nearly double from 44 at the end of 2013 to 86 by the end of 2020. Volaris' fleet plan should also help the company reduce its unit costs even further. First, Volaris is returning nearly all of its A319 aircraft in the next five years and replacing them with larger, more efficient models. Second, by the end of the decade, more than half of Volaris' fleet will use new engine technology that provides a double-digit reduction in fuel consumption. Together, these moves will allow Volaris to grow while reducing its cost structure, which should lead to tremendous profit growth. Potential Volaris investors should remember that the airline industry is risky under any circumstances, and Volaris competes in a particularly fast-changing market. On the other hand, the Mexican air-travel market is likely to grow by leaps and bounds during the next few decades, and Volaris is poised to grab a big chunk of that growth. Volaris posted solid earnings for the first three quarters of 2013 despite a sluggish economic environment: Mexico's GDP grew only 1.3% last year. By contrast, the Mexican government currently expects much stronger GDP growth of 3.9% in 2014. If this materializes, it will probably boost air travel demand in Mexico. Thus, while Volaris shares have fallen substantially in the last few months, short-term and long-term trends are both pointing in the company's favor. Accordingly, Volaris is one of my top picks in the airline sector for 2014.